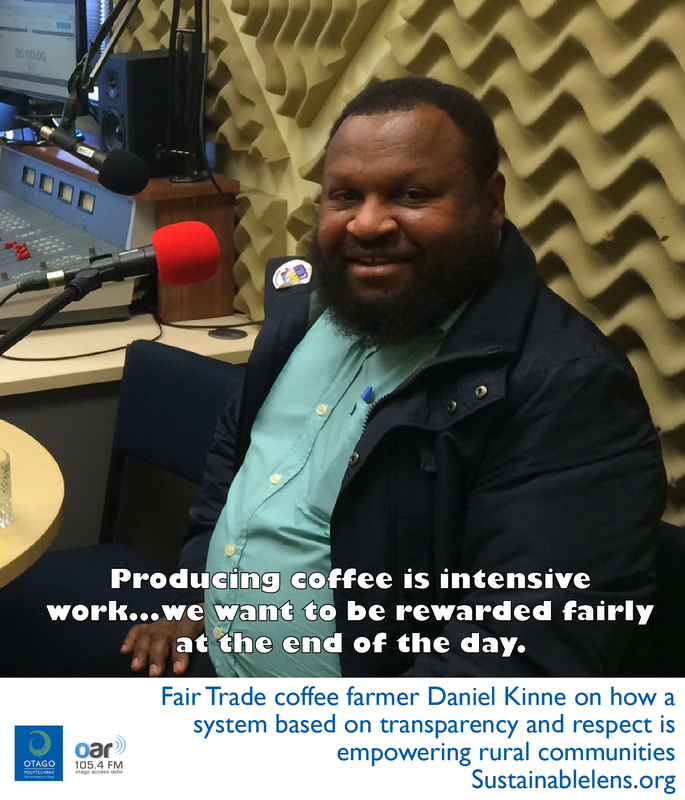 Daniel Kinne is a coffee farmer from the highlands of Papua New Guinea. He is also a founding member and the chairman, of the Highland Organic Agricultural Cooperative (HOAC) which includes 2600 farmers. Daniel has been in New Zealand to celebrate Fair Trade Fortnight, through Fairtrade New Zealand and to share his stories on the impact we have on communities like his when we buy Fair trade. We set up the cooperative to give a voice to the grower. We wanted to group ourselves to get into a system of trade. Transparency is the main standard in the Fair Trade system. Everything is done transparently so we don’t feel as though we have been cheated in any way. The cooperative is an inverted pyramid, the growers, the general assembly make all the important decisions. We get a guaranteed minimum price plus a social premium. We had to meet a set of standards – child labour, environmental, governance. There are standards of chemicals we are supposed to use, but for use, we are organic, so this is not an issue. But the Producer Support Team of New Zealand Australia Fair Trade helped us identify risk areas in own community – they helped us look at whether our water is at risk, is our forest at risk? What about the soil fertility? This really helped us to understand our environment and how best we could manage it. A buffer zone around a river for example. For somethings we couldn’t really see where they were coming from…we’ve got huge forest, so many trees, if I cut this we’ve still got plenty of trees. Our country is really young, we have not really experienced that kind of impact – that human activity can have on the environment. But through awareness, and we see on television, newspapers, people are talking “if you are not really careful, all your forest will be gone, the wildlife will be gone, about the future” – so they are telling us about their experience – you see this country it was big rainforest, now all that rainforest is gone due to cattle ranching or logging. We are in our little nutshell, we need to really come out to understand. When people from outside come and tell us such a thing, that really opens our minds – we are unconsciously doing these kinds of things that would mean we would eventually end up where they have ended up – so it is good that they are reminding us, so we can reconsider our ways and how we interact with the environment. We’ve employed a person to help us write environmental farm plans. Our life is very connected to the forest. When an environmental officer comes and says have respect for the environment, we have it already so it reinforces us and gives us that broader sense that every one of us should be looking after the environment. We sell our coffee to a Fair Trade exporter who sells in turn to a Fair Trade certified importer. Everyone in the supply chain of our coffee is certified and audited as Fair Trade. Fair Trade means we can look at it as a relationship – trust and respect. It is fair…because get the contract documents from overseas – the importer next down the supply chain. It is transparently available to us. We work out the price breakdown in a transparent manner, made possible by the Fair Trade system. We get the price, plus a social premium. The General Assembly decides how to spend that social premium – social projects, water quality, roading, schools. It was great to see our coffee on the shelf – a real sense of satisfaction. For the consumer they know from the Fair Trade logo that they are empowering rural people in developing countries, but when it comes to the exporter, importer and the roaster – they are looking out for quality, so when the quality comes with a message, there is a market, and everything fits together really well. If I could have brought my farmers here, they would be really amazed at what you have done here – the farms, the cities, the roads. From one extreme of life to the other extreme. They would say “wow, look at this, look how they have got everything organised, how they keep their place clean…how they live together in a clean and respectful environment”. Then later they would like to meet the consumers and hear about how they enjoy their coffee – this reminds them of the kind of work they are doing over there, and how this is appreciated by the consumer on this side. It connects these two and gives great satisfaction. Everyone that visits our Fair Trade system has been really moved by the work we are doing. (Could we do more to connect the producers to the consumers?) That is why I am here – telling our story. (Activist?) Yes. I see myself as someone who is very strong in trying to bring development to our community, and trying to do it properly so that everyone is happy and we see change in our community. I could consider myself as an agent for change. (Motivation?) When I wake up early in the morning I think about “alright, let’s move the coffee, let’s help the farmers sell the coffee for a good price, getting the money to the farmer and getting the coffee out while it is still fresh”. (Challenges?) Developing our own export system. (Miracle?) If the road system could be upgraded we could work day and night to get the coffee out, supplies in, and really build our community. Roads are the key to the health system, police, education. Our people are hard working, give them a chance and they’ll do it. We have put some of the social premium in to roads because then we can transport our coffee to the market point – and get a better premium. The empowerment is coming from the Fair Trade premium, we can move the coffee and still get a good price. (Advice?) Thank you to the good consumers who are buying Fair Trade produce – you are so wonderful. When we hear of cities like Wellington and Dunedin who are Fair Trade cities, this is really empowering us. We are really grateful. Thank you very much everyone for choosing Fair Trade, it gives us hope and meaning and purpose in the struggling rural outbacks.